If you’re looking for a slot that will keep you engaged and entertained as a game without any thought of money, Spy Game slot machine and Rival Gaming’s other I-Slots would be a great place to look. If you’re looking for the best graphics and pleasant game play, it’s best that you search somewhere else. Keep cool. The WMD is in the warehouse ahead. Use your cover to investigate the area before moving in. You’ll have to disable the bomb and catch the culprits to bring them back to be questioned at Headquarters. Well, that’s what you’ll be telling yourself when you begin the Spy Game slot machine by trying to find all of the pieces needed to disable a WMD. 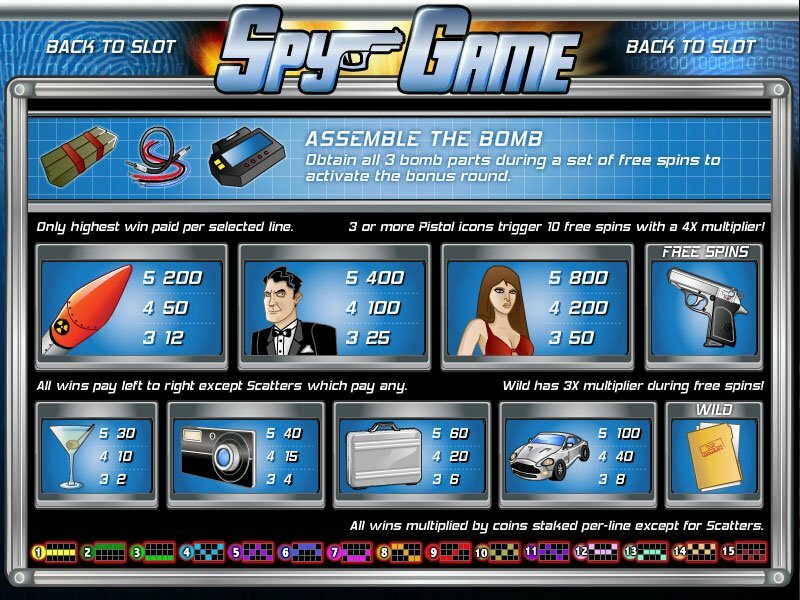 The Spy Game slot software is powered by Rival Gaming and gives a new face to the international spy theme that has become relatively common in slot machines. This is mostly accomplished simply by being one of Rival Gaming’s popular I-Slots. 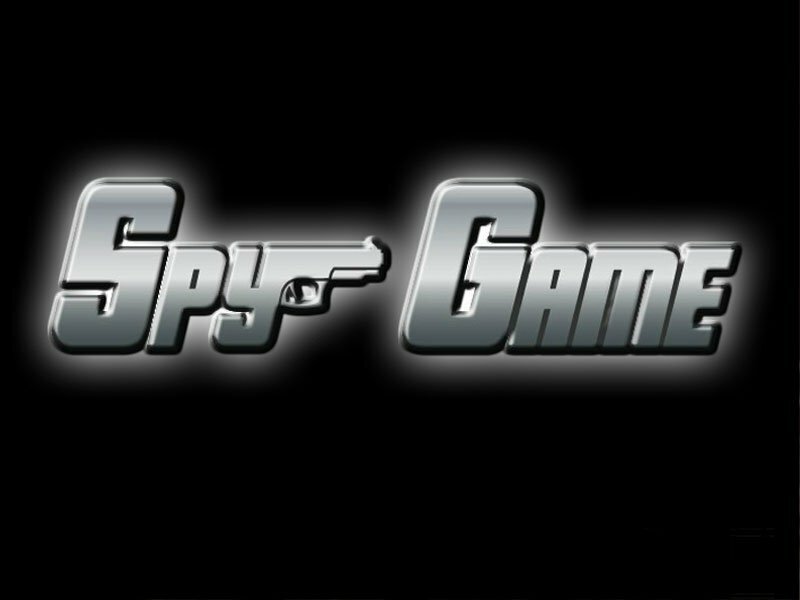 While Spy Game slot machine has all the gadgets and fancy story line needed for a good espionage slot, graphics and sound could use some improvement to contribute to the quality theme. I-Slots are innovative and creative slot machines that drag the player through a story line almost like the campaigns in a Playstation game. 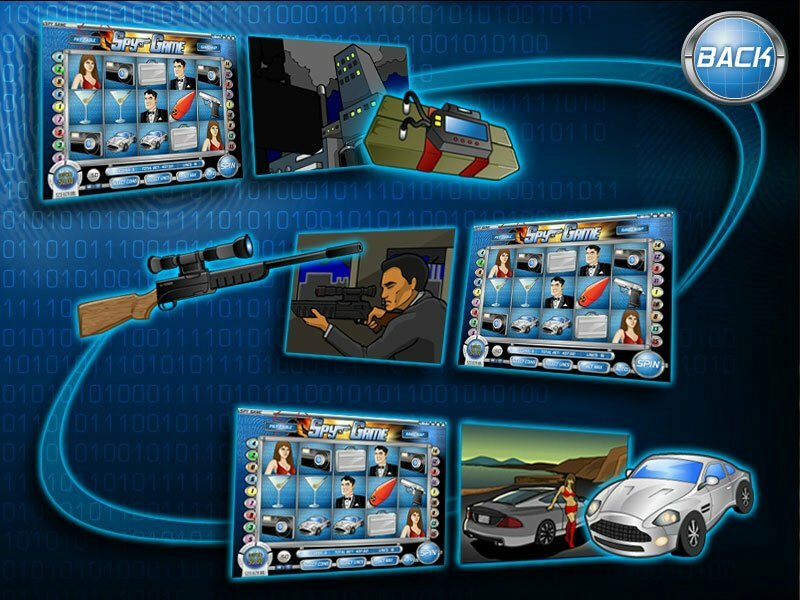 In the Spy Game slot machine, the player has to diffuse a deadly WMB before moving on to two more tasks. This is only accomplished by acquiring all of the bomb pieces you need, and this is only possible during free spins. You’ll find yourself just waiting on the edge of your seat waiting to trigger another set at free spins to get another crack at that bomb. This I-Slot is built on 5 reels and has 15 pay lines. In my own opinion the creators should have set it on 20-25 pay lines to increase pay out. Unfortunately the less frequent winnings probably discourage players. Rival Gaming is relying too much on the hope that players will keep spinning because of an intriguing story line. While Spy Game slot machine has all the gadgets and fancy story line needed for a good espionage slot, graphics and sound could use some improvement to contribute to the quality theme. Animations are limited and all the pictures are drawings of simple quality. Audio includes background music that adds good tension, but gets extremely repetitive after a short time of play. The I-Slot is a fantastic idea for its story-line and engaging creativity that has people playing more out of enjoyment of the game than the money they win, but graphics and sound need a good shove forward.